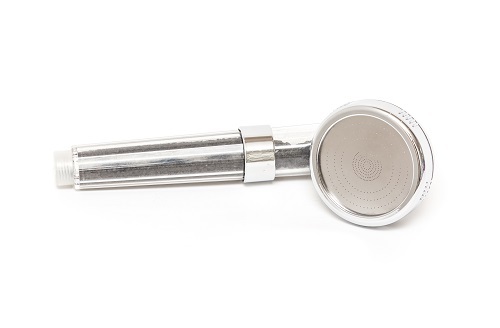 Shower Head with Karelian shungite is a unique solution for healthy living. Our skin and hair need special care. Our skin pH values are in the acidic range. When shungite water is used for the skin, it acts as an astringent producing a lifting effect and reducing wrinkles. Unlike other astringents, it leaves no chemical waste on your skin. Wash your face, body and hair with shungite (acidic) water with a pH of 5.5. This will improve your skin making it soft and smooth, and excessive dryness or oiliness will no longer be a problem. Pour some acidic water into a spray bottle and spray your body several times a day. Do not towel-dry your body but let it dry naturally. You will be amazed when you see the results! Use acidic water with a pH of 2.5 once a month for a deep peel. Wash your face with this highly acidic water a few times a day for one week. This will improve and rejuvenate your skin. You will no longer need to visit beauty salons offering expensive skin care products which, on top of that, may contain harmful chemical ingredients. Highly acidic water with a pH of 2.5 can cure various skin diseases, including eczema and fungal infections. This water also helps remove warts, skin imperfections and blemishes. There are no restrictions as to how often to use shungite water. The more often, the better. Make sure you do not use a towel but let the water dry naturally. With shungite water, your rash, wounds or burns will heal fast. Acidic water can also help you relieve itchy mosquito and other insect bites. If you have excessively oily skin with the so-called blackheads, apply a mask with alkaline water with a pH of 11.5. Soak a piece of gauze in this water and apply it to your skin until it is completely dry (20-30 min). It is especially effective for teen acne. Then wash your face with acidic water. In addition, alkaline water is great for restoring your hair. For more information about alkaline shower heads, click here. To find out more about shungite water, click here.